The Koh-i-Noor is a 106 carats diamond which was once the largest diamond in the world. Previously, it has belonged to various rulers in India; today it lies in the hands of the British royal family and is part of the Crown Jewels. Legend says that the diamond is 5000 years old and was referred to in Sanskrit writings as the Syamantaka jewel. But the first document that attests the history of the Koh-I-Noor dates back to 1526 when the Indian conqueror Babur had it in his possession. He mentioned that the diamond was owned by the Raja of Gwalior in the 13th century. The diamond belonged to various Indian and Persian rulers who fought bitter battles throughout history. The Koh-I-Noor was mounted on the Peaccock Throne, the Mughal throne of India. It is said that Shah Jahan, the ruler who commanded the building of the throne and that of the Taj Mahal was imprisoned by his son and he could only ever see the Taj Mahal again through the reflection of the diamond. Later, Shah’s son, Aurangazeb brought the Koh-I-Noor to the Badshahi Mosque in Lahore. 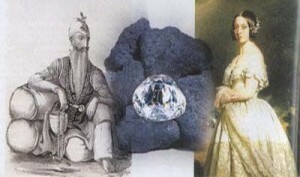 It was robbed from there by Nadir Shah who took the diamond to Persia in 1739, but the diamond found its way back to Punjab in 1813 after the deposed ruler of Afghanistan, Shuja Shah Durrani took it to India and made a deal to surrender the diamond in exchange for help in winning back the Afghan throne. The Brits came across the gem when they conquered Punjab in 1849, and Queen Victoria got it in 1851. The stone was then at 186 carats as before this point, the diamond was not cut. 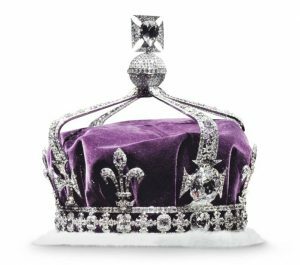 Along with over 2000 other diamonds, the Koh-I-Noor was mounted on the Crown. For a more elaborate history of the diamond, head to our history section. Since getting into British hands, the Koh-I-Noor was used by Queen Victoria, Queen Alexandra (wife of King Edward VII), Queen Mary and Queen Elizabeth. The diamond is wore only be female members of the British Royal Family. As of today, the Koh-I-Noor is on display in the Tower of London with the Crown Jewels. There is unknown the exact value of Kohinoor. The name means “Mountain of Light” in Persian. It is believed that the name was first used by Nader Shah who took possession of the diamond in 1739. Prior to this date, the name Kohinoor wasn’t used. There is an alleged curse on the Kohinoor that affects males who wear it (but females are immune). Since being in the possession of Queen Victoria, only women wore the diamond. It is believed that the famous Darya-ye Noor diamond is the Kohinoor’s double. The Darya-ye Noor is hosted in Iran and has 182 carats. Both India and Pakistan claim the diamond should be handed by the British back to them. When the Koh-i-noor diamond arrived in the hands of the British royal family it weighed 186 carats (37 grams). 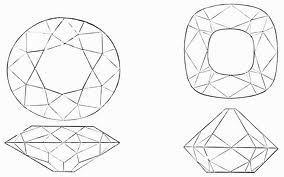 Prince Albert carefully searched for a diamond cutter with a very good reputation and headed to Netherlands where he gave the mission to cut the diamond to a certain Mr Cantor who began the difficult task of cutting it. Mr.
Cantor worked 38 days on the diamond. The diamond was cut into an oval shape and the weight was reduced to its current form and weigh of 108.93 carats. According to witnesses Prince Albert wasn’t satisfied of the cutting work as the diamond did not shine as much as before. The exact value of the Kohinoor diamond is unknown. Today it is on display in the Tower of London with the Crown Jewels. 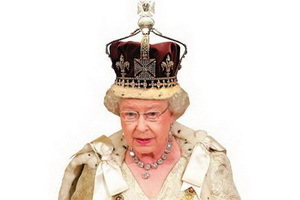 The whole value of the Crown Jewels is evaluated around $10 and $12 billion.